Together we can all use VoteBetter to change the political system. Do you feel that our political system works for you? I'm quite happy with it thanks. Our political system is broken. We feel the same. So let's start changing the system. Do you think our political system is as good as it can be? We agree. So let's start changing the system. As we have all seen, the political system drives MPs to think more about their own careers and the interests of their party than how best to represent the views of all of us. As a result, more and more of us are feeling let down by the status quo. But, it doesn't need to be this way. Together we can fix the system to make it work better for everyone. To do so we need to get involved and have our voices heard. We need to be back in control of politics. VoteBetter is an impartial online tool to help you stay informed and enable you to express your views on the issues important to you - both locally and nationally. 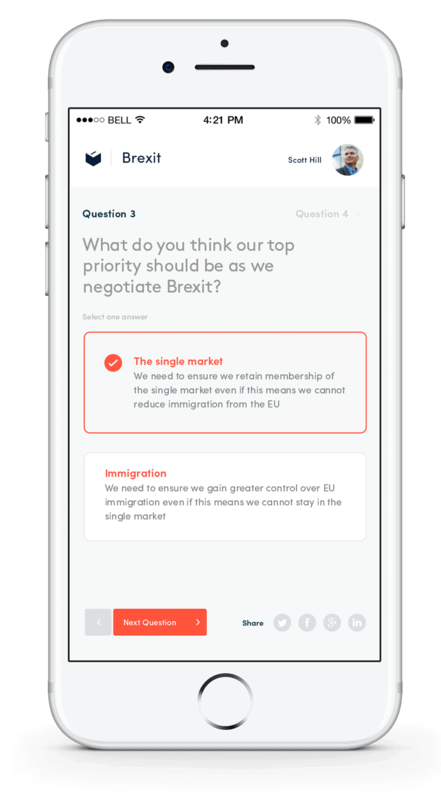 Use VoteBetter to personalise and customise politics. Build a political profile, curate your own manifesto, express your views and rank your priorities. Compare and share with others. Follow and be followed. Send your choices to your MP and other politicians. Explore issues and learn key facts. Understand different policy options. Take surveys on specific issues. Vote for what you think's best. See how your priorities and views compare to others'. See how much we agree on, and where we differ. Send your VoteBetter profile - or part of it - to friends, to your network and to your MP or other politicians. Learn from and influence others. Follow and be followed. Allocate your votes on specific issues to whoever you think knows best. Get others involved and build support for your choices.